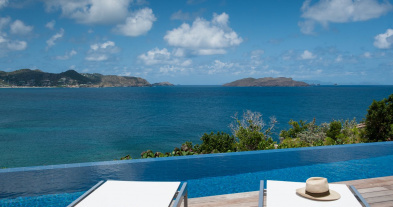 This Luxury Villa BELLEVUE property is one of the biggest and most affordable rates in St-Barths. This is the best choice for large groups looking for great amenities, in a very secluded area, and a total privacy. Classically chic and understated, the decoration of VILLA BELLEVUE conspires with its high hillside setting and sparkling views to create a boundless sense of tranquility. 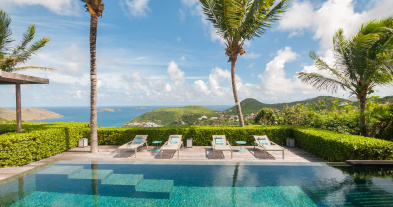 While it’s a gracious vacation home for gathering with a larger family or group of friends, the luxury property also inspires profound tranquility, in which you’re often moved to do nothing more but soak up the sunshine, while feeling the balmy Caribbean breeze and gazing out over Marigot Bay and Turtle Island—that view is "très belle", indeed. 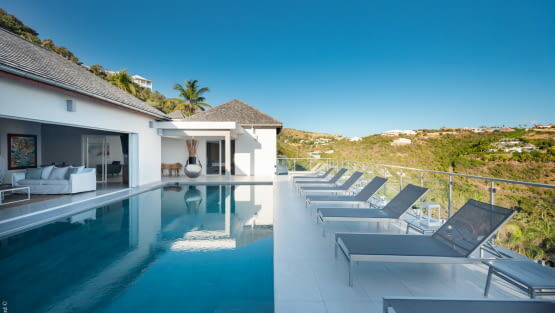 Quiet, spacious and modern, Villa BELLEVUE in St. Barth its the most luxurious 5 bedrooms villa with a competitve price. The newly renovated rental home benefits from its location on a lesser-trafficked hillside above Marigot Bay, which gives it an unrestricted view. With five large bedrooms and spacious indoor and outdoor living areas spread over two levels, it’s a kingdom-as-cocoon. Open and airy, the design allows the breezes to flow through, and the living room opens directly onto a large terrace faces the view and is soaked by the morning sun. Along with two pools, which are suitable for both lounging and swimming laps, there is a fitness room and home cinema. That beautiful villa, the owner of VILLA BELLEVUE opted for a classic, neutral decor, enlivened with pops of color in couch cushions and paintings by the artist Zaza Noah. 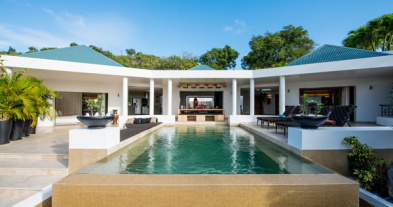 The clean-lined design adds to the feeling of expansiveness, which is already quite considerable, given the size of the rooms—each of the five bedrooms has a king-size bed and a full bathroom with a tub, which makes the villa ideal for groups of adults to share. Upstairs, there is abundant space for socializing. A well-equipped kitchen in the back flows into a living room and dining room under vaulted dark-wood ceilings, and then the terrace and pool outside. To one side of this living room are two bedrooms, one of which has a sea view and terrace. To the other side is a third bedroom, which also has a view and a private terrace. Downstairs can be reached by a staircase behind this third bedroom, or by its own entrance outside. On this level are the fitness room and home cinema, flanked by a bedroom on either side. 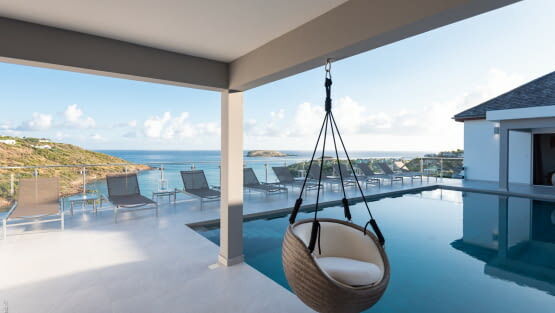 Both of these have sea views and private terraces, and one of them has a pool. It’s a generous layout that allows everyone privacy, but also plenty of room to enjoy each other’s company. VILLA BELLEVUE is an ideal choice for large groups traveling together and looking for spaciousness, total privacy, convenience and breathtaking views of Marigot bay. With the rental of Villa BELLEVUE you have a free half-day boat trip. Very spacious air conditioned great room (+ ceiling fans) with a large living area which large window doors open widely onto the lap pool, and offering a gorgeous ocean view. Huge wall flat screen television with Direct TV, Canal Satellite and DVD player. Telephone, WIFI, Ipod dock. Fully equipped air-conditioned kitchen, with electric oven and gas stove, microwave, toaster, Nespresso coffee machine, dishwasher, 1 fridge and freezer, 1 extra fridge, electric kettle, electric fruit squeezer, hood.The dining area features 2 rectangular wood that can be pulled together to comfortably accommodate 10 guests, Outside Dining table by the pool terrace. MAIN LEVEL: king size bed, air conditioning, ceiling fan, HDTV, DVD player, radio with Ipod dock, telephone, WIFI, dressing, safe, Spacious ensuite bathroom with bathtub and shower, 2 sinks, hair dryer, towels and beach towels,Private ocean view terrace. MAIN LEVEL: king size bed, air conditioning, ceiling fan, HDTV, DVD player, radio with Ipod dock, telephone, WIFI, dressing, safe, Spacious ensuite bathroom with bathtub and shower, sink, hair dryer, towels and beach towels, Garden View. 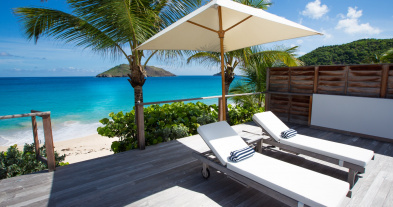 LOWER LEVEL: king size bed, air conditioning, ceiling fan, HDTV, DVD player, radio with Ipod dock, telephone, WIFI, dressing, safe, Spacious ensuite bathroom with bathtub and shower, 2 sinks, hair dryer, towels and beach towels,Private ocean view terrace, private pool. LOWER LEVEL: king size bed, air conditioning, ceiling fan, HDTV, DVD player, radio with Ipod dock, telephone, WIFI, dressing, safe, Spacious ensuite bathroom with bathtub and shower, 2 sinks, hair dryer, towels and beach towels,Private ocean view terrace, private entrance. LOWER LEVEL: Air conditioned TV room with sofas and armchairs for 6-8 guests, large wall Projector with surround sound system, Blue Ray DVD player. LOWER LEVEL: Air conditioned fitness room equipped with treadmill, stepper, bicycle. Larges areas on the 2 levels, comfy sofas and lounging chairs. One large lap pool on the main level, laying just in front of the great room and surrounded by a terrace with lounge chairs. One private Plunge pool by the bedroom 4. Beach chairs at guests disposal.